Twilight Zone: The Movie is a 1983 American science fiction horror anthology film produced by Steven Spielberg and John Landis as a cinematic interpretation of the 1959–64 TV series created by Rod Serling. The film stars Vic Morrow, Scatman Crothers, Kathleen Quinlan and John Lithgow with Dan Aykroyd and Albert Brooks in the prologue segment. Burgess Meredith, who starred in four episodes of the original series, took on Serling's position as narrator. In addition to Meredith, six actors from the original series (William Schallert, Kevin McCarthy, Bill Mumy, Murray Matheson, Peter Brocco, and Patricia Barry) had roles in the film. The film is a remake of three classic episodes of the original series and includes one original story. Landis directed the prologue, the first segment and the epilogue, Spielberg directed the second, Joe Dante the third, and George Miller directed the final segment. Dante recalled that in the film's original conception the four stories would be interwoven with characters from one segment appearing in another segment, but later problems with the film precluded this. The film garnered notoriety before its release for the stunt helicopter crash which took the lives of Vic Morrow and two child actors, Myca Dinh Le and Renee Shin-Yi Chen, during the filming of the segment directed by Landis. The two child actors were hired illegally. Their deaths led to a high-profile legal case, although at the end of the trial no one was found to be criminally culpable for the accident. Two men are in a car driving along a lonely country road very late at night. The conversation turns to what episodes of The Twilight Zone they found most scary. The passenger then asks, "Do you want to see something really scary?" and says to pull over. He turns into a monster and attacks the driver. You unlock this door with a key of imagination. Beyond it is another dimension; a dimension of sound, a dimension of sight, and a dimension of mind. You are moving into a land of both shadow and substance, of things and ideas. You have just crossed over into The Twilight Zone. You're about to meet an angry man: Mr. William Connor, who carries on his shoulder a chip the size of the national debt. This is a sour man, a lonely man, who's tired of waiting for the breaks that come to others, but never to him. Mr. William Connor, whose own blind hatred is about to catapult him into the darkest corner of The Twilight Zone. Bill Connor is bitter after being passed over for a promotion in favor of a Jewish co-worker. Drinking in a bar after work with his friends, Bill utters slurs towards Jewish people, black people, and Asian people. A Black man sitting nearby asks him to stop. Bill leaves the bar angrily, but when he walks outside, he finds himself in Nazi-occupied France during World War II. A pair of SS officers patrolling the streets interrogate him. Bill cannot answer satisfactorily since he does not speak German. A chase ensues, and Bill ends up on the ledge of a building, where he is shot at by the officers. He falls from the ledge and lands in the rural South during the 1950s. There a group of Ku Klux Klansmen sees him as an African-American man, whom they are about to lynch. Bill vehemently tells them he is white, to no avail. While trying to escape, he jumps into a lake and surfaces in a jungle during the Vietnam War, being fired at by American soldiers, one of whom throws a grenade. Instead of killing him, the grenade launches him into occupied France again. There he is captured by the SS officers and put into an enclosed railroad freight car, along with Jewish prisoners. Bill sees the bar with his friends standing outside looking for him. He screams for help, but they cannot see him or the train as it pulls away. This segment also contains an inside joke from director John Landis. During the segment where Bill is in Vietnam, one American soldier says to another: "I told you guys, we shouldn't have shot Lieutenant Neidermeyer." This is a reference to the character of the same name in the film Animal House, which was also directed by Landis. At the end of Animal House, the viewers are told what later happened to each of the main characters; it states that Douglas Neidermeyer was, "killed in Vietnam by his own troops." Note: Originally, this segment was to end with Bill returning to his own time after redeeming himself by saving the lives of two Vietnamese children during a helicopter raid on their village. The aforementioned scene was dropped due to the death of Morrow and two child actors during filming. An old man named Mr. Bloom has just moved into Sunnyvale Retirement Home. He listens to the other elders reminisce about the joys they experienced in their youth. Mr. Bloom says just because they are old does not mean they cannot enjoy life anymore. He tells them that later that night, he will wake them and that they can join him in a game of kick the can. Leo Conroy objects, saying that now that they are all old they cannot engage in physical activity. While Mr. Conroy sleeps, Mr. Bloom gathers the rest of the residents outside and plays the game, during which they are transformed into childhood versions of themselves. They are ecstatic to be young again and engage in activities they enjoyed long ago, but their thoughts soon turn to practical matters such as where they will spend the night, since they will no longer be welcomed in the retirement home and their families won't recognize them. They ask to be old again. Mr. Bloom grants their wish. Leo Conroy wakes up and witnesses one resident, Mr. Agee, who still remains young, and asks for Agee to take him along. Agee tells Conroy that he cannot go with him. The segment ends with Conroy kicking a can around the yard, having changed his attitude on life, while Mr. Bloom leaves Sunnyvale and moves into another retirement home, to spread his good-natured magical skills to other senior citizens. Portrait of a woman in transit: Helen Foley, age 27. Occupation: schoolteacher. Up until now, the pattern of her life has been one of unrelenting sameness, waiting for something different to happen. Helen Foley doesn't know it yet, but her waiting has just ended. Helen Foley, traveling to a new job, visits a rural bar for directions. While talking to the owner, she witnesses Anthony—a young boy playing an arcade game—being harassed by a local. Helen comes to the boy's defense. As Helen leaves the bar, she backs into Anthony with her car in the parking lot, damaging his bicycle. Helen offers Anthony a ride home. When Helen arrives with Anthony at home, she meets his family: Uncle Walt, sister Ethel, and mother and father. Anthony's family are excessively welcoming. Anthony starts to show Helen around the house, while the family rifles through Helen's purse and coat. There is a television set in every room showing cartoons. She comes to the room of another sister, Sara. Helen calls out to the girl, who is in a wheelchair and watching television, and gets no response. Anthony explains that Sara had been in an accident; Helen isn't able to see that the girl has no mouth. Anthony announces that it is time for dinner, which consists of ice cream, candy apples, potato chips, and hamburgers topped with peanut butter. Confused at first at how the family eats, Helen thinks that this is a birthday dinner for Anthony. Ethel complains at the prospect of another birthday; Anthony glares at her, and her plate flies out of her hands. Helen attempts to leave, but Anthony urges Helen to stay and see Uncle Walt's "hat trick". A top hat appears on top of the television set. Uncle Walt is very nervous about what could be in the hat, but he pulls out an ordinary rabbit. Anthony insists on more, and a large, mutant rabbit springs from the hat. As Helen attempts to flee, she spills the contents of her purse, and Anthony finds a note inside stating "Help us! Anthony is a monster!" When the family points the finger at Ethel, she reveals to Helen that they are not Anthony's real relatives; Anthony brought them to his house to be his surrogate family after he killed his parents, and presumably he is doing the same with Helen. In punishment for writing the note, Anthony puts Ethel into the television set where she is pursued and eaten by cartoon monsters. Helen attempts to escape only to have the door blocked by a giant eye. Anthony vents his frustration at everyone being afraid of him. He makes the entire house disappear, taking himself and Helen outside the physical plane of existence. Anthony says that he sent his "family" back where they came from, since they didn't want to be with him. He cannot understand why everyone is unhappy with him, since he believes he provided for their every possible desire. Helen offers to be Anthony's teacher, and help him find new uses for his power. After extracting a promise that she would never leave him, Anthony welcomes Helen's offer and makes her car reappear. As they drive through a desert landscape, meadows filled with bright flowers spring up alongside the road in the car's wake. What you're looking at could be the end of a particularly terrifying nightmare. It isn't. It's the beginning. Introducing Mr. John Valentine, air traveler. His destination: The Twilight Zone. While flying through a violent thunderstorm, airline passenger John Valentine is in an airplane lavatory as he tries to recover from a panic attack due to a fear of flying. The flight attendants coax Valentine from the lavatory and back to his seat. Valentine notices a hideous gremlin on the wing of the plane and begins to spiral into another severe panic. He watches as the creature wreaks havoc on the wing, damaging the plane's engine. Valentine finally snaps and attempts to break the window with an oxygen canister, but is wrestled to the ground by another passenger (an off-duty security guard). Valentine takes the passenger's gun, shoots out the window (causing a breach in the pressurized cabin), and begins firing at the gremlin. This only serves to catch the attention of the gremlin, who rushes up to Valentine and destroys the gun. After they notice that the plane is landing, the gremlin grabs Valentine's face, then simply scolds him for spoiling its fun by wagging its finger in his face. The creature leaps into the sky as the airplane begins its emergency landing. The police, crew, and passengers write off Valentine as insane. However, the aircraft maintenance crew arrives and finds the damage to the plane's engines complete with claw marks, while a straitjacketed Valentine is carried off in an ambulance. During the filming of the "Time Out" segment directed by Landis on July 23, 1982, at around 2:30 a.m., actor Vic Morrow and child actors Myca Dinh Le (age 7) and Renee Shin-Yi Chen (Chinese: 陳欣怡; pinyin: Chén Xīnyí, age 6) died in an accident involving a helicopter being used on the set. The two child actors were hired in violation of California law, which prohibits child actors from working at night or in proximity to explosions, and requires the presence of a teacher or social worker. During the subsequent trial, the illegality of the children's hiring was admitted by the defense, with Landis admitting culpability for that (but not the accident), and admitting that their hiring was "wrong". The probable cause of the accident was the detonation of debris-laden high-temperature special effects explosions too near a low-flying helicopter leading to foreign object damage to one rotor blade and delamination due to heat to the other rotor blade, the separation of the helicopter's tail rotor assembly, and the uncontrolled descent of the helicopter. The proximity of the helicopter (around 25 feet off the ground) to the special effects explosions was due to the failure to establish direct communications and coordination between the pilot, who was in command of the helicopter operation, and the film director, who was in charge of the filming operation. The deaths were recorded on film from at least three different camera angles. As a result of Morrow's death, the remaining few scenes of the segment could not be filmed and all of the scenes that were filmed involving the two Vietnamese children, portrayed by Myca and Renee, were deleted from the final cut of the segment. Myca and Renee were being paid under the table to circumvent California's child labor laws. California did not allow children to work at night. Landis opted not to seek a waiver. The casting agents were unaware that the children would be involved in the scene. Associate producer George Folsey, Jr. told the children's parents not to tell any firefighters on set that the children were part of the scene, and also hid them from a fire safety officer who also worked as a welfare worker. A fire safety officer was concerned the blasts would cause a crash, but did not tell Landis of his concerns. The accident led to civil and criminal action against the filmmakers which lasted nearly a decade. Landis, Folsey, production manager Dan Allingham, pilot Dorcey Wingo and explosives specialist Paul Stewart were tried and acquitted on charges of manslaughter in a nine-month trial in 1986 and 1987. As a result of the accident, second assistant director Andy House had his name removed from the credits and replaced with the pseudonym Alan Smithee. 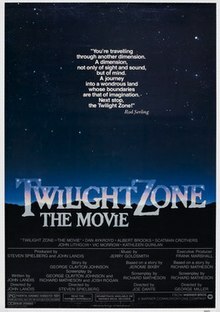 Twilight Zone: The Movie opened on June 24, 1983 and received mixed reviews. Roger Ebert of the Chicago Sun-Times rated each segment individually, awarding them (on a scale of four stars): two for the prologue and first segment, one-and-a-half for the second, three-and-a-half stars for the third, and three-and-a-half for the final. Ebert noted that "the surprising thing is, the two superstar directors are thoroughly routed by two less-known directors whose previous credits have been horror and action pictures... Spielberg, who produced the whole project, perhaps sensed that he and Landis had the weakest results, since he assembles the stories in an ascending order of excitement. Twilight Zone starts slow, almost grinds to a halt, and then has a fast comeback." The New York Times' film critic Vincent Canby called the movie a "flabby, mini-minded behemoth." In the modern day, critical reception is still divided; on the review aggregate website Rotten Tomatoes, the film has a 61% "fresh" approval rating, based on 36 reviews, with a rating average of 5.8 out of 10. The critical consensus was "The Twilight Zone: The Movie suffers from the typical anthology-film highs and lows; thankfully, the former outnumber the latter". On Metacritic, the film has a score of 38 out of 100, based on six reviews, indicating "generally unfavorable reviews". According to Box Office Mojo, it opened at #4, grossing $6,614,366 in its opening weekend at 1,275 theaters, averaging $5,188 per theater (adjusting to $15,076,555 and a $11,825 average in 2009). It later expanded to 1,288 theaters and ended up grossing $29,450,919 (adjusting to $67,129,396 in 2009). Having cost $10 million to make, it was not the enormous hit which executives were looking for, but it was still a financial success and it helped stir enough interest for CBS to give the go-ahead to the 1980s TV version of The Twilight Zone. It was released to LaserDisc and VHS several times, most recently as part of WB's "Hits" line, and was released for DVD, HD DVD, and Blu-ray on October 9, 2007. Robert Bloch wrote the book adaptation of Twilight Zone: The Movie. Bloch's order of segments does not match the order in the film itself, as he was given the original screenplay to work with, in which "Nightmare at 20,000 Feet" was the second segment, and "Kick the Can" was the fourth. Both the movie's prologue and epilogue are missing in the novelization. Bloch claimed that no one told him the anthology had a wraparound sequence. Bloch also said that in the six weeks he was given to write the book, he only saw a screening of two of the segments; he had to hurriedly change the ending of the first segment, after the helicopter accident that occurred during filming. As originally written, the first segment would have ended as it did in the original screenplay (Connor finds redemption by saving two Vietnamese children whose village is being destroyed by the Air Cavalry). The finished book reflects how the first segment ends in the final cut of the film. Jerry Goldsmith, who scored several episodes of the original series, composed the music for the movie and re-recorded Marius Constant's series theme. The original soundtrack album was released by Warner Bros. Records. "Time Out" is the only segment whose music is not included in the overture (actually the film's end title music). A complete recording of the dramatic score, including a previously-unreleased song by Joseph Williams, was released in April 2009 by Film Score Monthly, representing the soundtrack's first US release on Compact Disc. Both songs were used in "Time Out" and were produced by Bruce Botnick with James Newton Howard (Howard also arranged "Nights Are Forever"). The promotional song from this movie, "Nights Are Forever", written by Jerry Goldsmith with lyricist John Bettis, and sung by Jennifer Warnes, is heard briefly during the jukebox scene in the opening segment with Vic Morrow. ^ "The Twilight Zone (15)". British Board of Film Classification. July 6, 1983. Retrieved January 12, 2015. ^ "Twilight Zone: The Movie (1983) - Box Office Mojo". www.boxofficemojo.com. ^ Larnick, Eric (September 26, 2012). "Joe Dante, 'The Hole' Director On New Horror, '80s Favorites And More 'Gremlins'". Moviefone. Archived from the original on October 17, 2012. ^ Weber, Bruce. "James F. Neal, Litigated Historic Cases, Dies at 81", The New York Times, October 22, 2010. Accessed October 23, 2010. ^ Luz, Tim. "Movie In-Jokes: Twilight Zone: The Movie". Retrieved March 5, 2019. ^ a b Noe, Denise. The Twilight Zone Tragedy Archived January 22, 2009, at the Wayback Machine. Crime Library. Accessed 2011-02-09. ^ "Aircraft Accident Report" (PDF). National Transportation Safety Board. Archived from the original (PDF) on March 5, 2012. Retrieved February 6, 2012. ^ Feldman, Paul (May 29, 1987). "John Landis Not Guilty in 3 'Twilight Zone' Deaths : Jury Also Exonerates Four Others". Los Angeles Times. Retrieved July 26, 2012. ^ Ebert, Roger. "Twilight Zone -- The Movie". Sun Times. Retrieved February 6, 2012. ^ "Twilight Zone: The Movie (1983)". Rotten Tomatoes. Retrieved February 6, 2012. ^ "Twilight Zone: The Movie". Box Office Mojo. Retrieved February 6, 2012. ^ Bloch, Robert (1983). Once Around the Bloch: An Unauthorized Autobiography. Tor Books. pp. 388–389.